Ok here it is, the thing my friends have asked about the most, the Benton Snail Bee review. 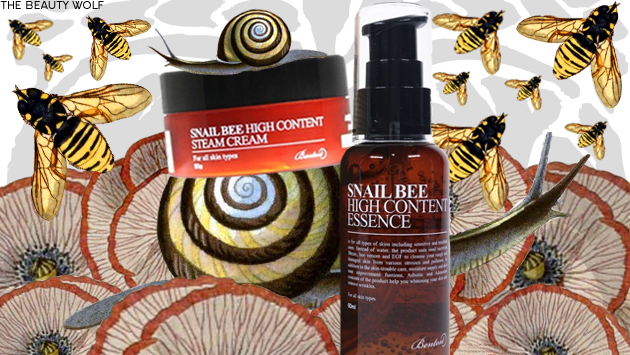 We’re going to be looking at the Benton Snail Bee High Content Essence, and the Snail Bee High Content Steam Cream. The reason I’m going to review them together is I really don’t think they should be broken up. If you use one you should really be using the other because although they’re both stellar products on their own, they’re a phenomenal team when paired together. So, let’s get right to business. I’ve had people ask me what exactly an essence is and what it’s for since traditional North American skincare regimes don’t usually have an essence step. This “essence” is really just a high concentration of outstanding ingredients in a clear liquidy-gel form. If you’ve ever used a serum it’s pretty much that. I think if I were to rebrand this for the North American market I would rename is as such. When I say a high concentration of great ingredients I mean it. The main ingredient is snail secretion filtrate. Ok, I’m going to get real with you right now. I’ve had people catch a case of the vapors and act like they were delicate Southern ladies from the 1800’s about to faint when I revealed my holy grail products contained snail secretion. Y’all need to grow up and get over it because this stuff is absolutely incredible. People have asked “Is it slimy though? I couldn’t stand it if it were slimy” It is 100% absolutely NOT slimy, not even a little bit. You would never know what the miracle ingredient was if it weren’t on the bottle. I’ve also been asked what the benefits are. I’m going to really oversimplify a lot of scientific work here; snail secretions have been shown to help with healing, reducing damage from photoaging, inhibiting infections, not to mention it’s all natural and extremely soothing and nourishing. Even the most sensitive of skins (I’m your guinea pig representative sensitive skinners out there) will love this because there’s absolutely nothing in here that’s going to kick up a fuss. You’ll also notice once again they’ve replaced water with aloe leaf juice which I already talked about how wonderful that is in my Benton toner and gel reviews. The essence itself is clear and has a very faint smell that I can’t quite put my finger on. It’s like this strange hybrid of earth and ozone. Whatever it is it doesn’t last long and by the time you’ve rubbed this into your skin it’s gone. It’s more watery than the Benton gel but thicker than just water. It comes in a pump bottle and I use about 2-3 pumps and that’s enough to cover my entire face, neck, and décolletage. I’ve also been asked where this fits in, as in, what step it is. After you’ve washed your face and applied your toner, apply the essence. It’s before your gel and before your cream. A simple way to remember is to apply things in order of their consistency, from lightest to heaviest. Of course your toner is the most watery, then the essence, then your gel, and then finally your cream. Sometimes there are some surprises in a Korean skincare regime, especially when you reach the 6-8 product mark like I have, but that’s a good rule of thumb. Now before I get to it’s grade let’s move on to the steam cream review. Holy. Fuuuuu. Where do I begin? My absolute fall down and start worshipping at the altar of Korean Skincare Jesus product. This is what made me an absolute convert. I can’t remember where first read about this cream but I do remember google taking me to a review from the Skin&Tonics blog (an amazing read btw, check it out!). I had already placed an order by the time I got to the end of the page. Looking at the ingredients there were some real eye catchers that sealed the deal for me. You can get $5 off your first W2Beauty order by signing up via my affiliate link and entering code 071087605 upon sign up! Aaaah I am so cracking open my wallet for this whole line! Oooo yay! Let me know how you like it! I have the essence and the aloe toner and recently got the steam cream and I completely agree with you! Ah-Freaking-Mazing stuff! Totally got rid of the last of my breakouts (together with the other Benton products) and despite being a rich moisturizing cream, actually leaves a semi-matte finish on my skin 😀 I’ve had the same reactions as you though, when I told my friends about my skincare products…sigh. Guys open up your minds!! I mean, I would put bird poop on my face if it actually controlled my breakouts, a little snail slime won’t hurt you. Yay!!! I’m so glad you had great results with it as well! I’m going to lose my mind if they ever stopped making this stuff. I had to literally stop what I was doing and knock on wood after I typed that last sentence. I’m slowly brining all my friends around on the idea that snail slime and bee venom are things that they desperately need to slather on their faces. Either I’m a convincing person or they just want me to stop jabbering on and on about it 😉 Really, either one is entirely possible. Once I heard snail slime and bee venom could potentially help breakouts I got on board with the idea right away 😛 It didn’t even gross me out a bit, which is pretty impressive since I have an unreasonably fear of slugs and snails! Hi! 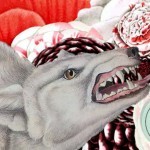 Just started reading your blog and I love the layout and design. Also, great review! I also recently started using Benton products (just the toner, aloe gel and the essence), and already I can already feel a significant difference with the texture of my skin! Haven’t used it long enough to see any big difference with my post-acne discoloration, but I’ve been taking photos so hopefully will be able to see the difference real soon! I didn’t purchase the cream at the time because I was worried about it being too greasy/heavy for my acne prone skin. Maybe give it a try when I order my next batch of korean products… I just want to ask, how long does it it take for the cream to be absorbed? I ordered the steam cream but did not have high hopes for using it – I live in a humid climate and generally hate moisturizers, but this is really surprisingly light. It is drier than normal right now, so I’m not sure if I’ll use it in the summer, but for now, it’s amazing! And I no longer have to worry that I’m inviting early aging into my face by using nothing. I’d love to spread the word about Benton Snail Bee to my brides preparing their skin for their big day. But definitely want to try it first! Where’s the best place to buy this dynamic duo? Hello there! What a wonderful idea! I really think brides would love the almost instant results they can feel and it would keep them encouraged to keep up with the routine. Love your blog and reviews! I’m definitely going to buy this duo after seeing your review and SkinandTonics’ review — my question is — I’m on the fence about the Benton Aloe stuff. Do I NEED the BHA toner? I have no patience for too many steps. Right now I’m using Missha FTE and I want to add these 2 to the night time line up. Do you think the Aloe items are “necessary”? I hate paying for shipping from Korea and then wishing I bought more items but the wallet is thin lately lol …. Thanks! I would say yes only because I really like the way they work in concert with each other. What kind of skin do you have? I use the Missha FTE also, but then I follow it with the AHA toner (and sometimes the new snail bee toner) with a few drops of the OST Vitamin C20 serum mixed in. I really like the results I saw with that. Thank you so much for turning me to these two products! I decided to give it a shot after I read your review and I’ve only used it for maybe 3 weeks but it’s done wonders for the breakouts on my chin that I couldn’t get rid off since last year. It’s amazing, and I’m really looking forward to trying other Benton products! I’m so so so glad it’s working for you! I’m such a fan of that line and I love it when someone tries it and then understands why I fawn over it, haha! I have never hit the “put in basket” button so fast in my life before! Thanx for such an informative, researched review. Well, Just bought essence and steam cream based on it. I’m a 50yr old who hikes and plays tennis hours in tropical sun, slapped cheap body lotion on face; ditto body wash! But got hooked onto Korean products in LA when given a handful of bee venom samples – am ready to expand horizons into snail slime and snake venom (all peptides, I’ve read). This new-gen stuff works to stimulate the skin into producing collagen/halyuronic acids as its widely admitted that its impossible for topicals to penetrate skin barrier (microns too large). Package arrives in 2 weeks, if Benton stuff helps this leathered old lady, will help anyone! I’ve just bought this line for myself but might want to buy it to my mum too, could you do me a grand favour and tell me if it works for you? Hi Beautywolf, I just received the entire line of Benton skincare (took less than 2 weeks to arrive from ebay) and applied it after showering, all four products. Feels great on my face but turned my sensitive skin turned bright red after first application..and is still hot to touch an hour later, but it didn’t sting when applying. I read the tiny print on the Benton boxes and this is a skincare line that WHITENS (i.e., yes, has acids in it to brighten which must be the culprit for my instant irritation) and MOISTURIZES (that part is very good for thirsty, mature skin). This isn’t for for redness or irritation prone sensitive skin. I’ll keep using it for a full week and post again, unless I break out. Wish I could post my before and after photo. Love your site and product ideas. Thanks! I’m sorry you’re sensitive to one of the ingredients! The acid concentration in the Benton line is actually pretty low, so unless you have a specific known sensitivity to acids, it’s more likely that you’re having a reaction to one if the many plant extracts in the formula. I’m sorry that happened to you! Seeing as this product has a gel-like consistency, should it be applied before or after the Hada Labo Hyaluronic Lotion? I really need all the moisture I can get! Hm… I’ve read a lot about this product and how it does miracles with skin conditions (I suffer from cystic acne) I though have some doubts If I can use it so young, as I’m only 23. I mean… I have no wrinkles whatsoever and I’m freaking out that If I use it now, there wouldn’t be any effect on my skin when I need it later.